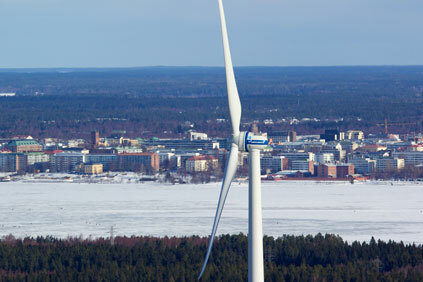 FINLAND: Finnish wind industry start-up Mervento earlier this year installed a 3.6MW direct drive prototype with 118-metre rotor diameter, designed for cold climates. Eize de Vries spoke with sales manager Marko Kristola on turbine innovative features and what the future might hold. The 3.6-118 is designed for IEC WC IIA conditions and is capable of operating in an extended temperature range (-300C to +400C) encountered in Nordic countries. Kristola says: "Our product-market focus is at installations on both near-shore and low wind offshore, like Baltic Sea conditions, and the manufacturing licence offering to third parties in Asia and the Americas." Kristola said Mervento originates from Finnish engineering company Enmac. Back to 2008 it asked the simple question: what should an optimal turbine design look like when starting from a clean sheet of paper without historical burden? Kristola says: "Wind turbine designs have remained almost unchanged for decades. Mervento started from the perspective that wind turbines are power plants. All technical solutions are dedicated and each focuses on contributing towards achieving the lowest possible life-cycle-based cost of energy. Closely interlinked is a high level of component and system integration including easy turbine access and optimized serviceability." The in-house designed front-mounted 3.9kV medium-voltage permanent magnet generator is an outer-rotor design with the rotor turning around the stator part. The generator is air cooled with a redundant air-to-air heat exchanger inside the nacelle, while hub access is enabled through the hollow main shaft. "Similar to most metal fabricated components used, Mervento designed the structural generator components in-house," says Kristola. "Active generator parts incorporating magnets, copper windings and magnetic steel, originate from The Switch." The hydraulic blade pitch system is based on three complementary systems: blade feathering in stationary mode, collective blade pitch during normal operation, and cyclic pitching as a function of wind shear. Cyclic pitching enables the adjustment of individual blade pitch angles during each rotor revolution. Benefits include substantially reduced rotor blade and turbine loads above rated and increase energy production below rated wind speeds as well as reduced aerodynamic rotor noise. However, critics of the system point out the risk of wear and premature failures due to frequent pitch system actions. In response, Kristola says: "Mervento’s proven helicopter technology-based cyclic-pitch system is fully mechanical without moving actuators (cylinders), adding to system reliability and minimized internal energy use." The yaw system consists of multiple hydraulic actuators integrated with a yaw brake, whereas common wind turbine yaw systems comprise a yaw bearing with external/internal gear and multiple yaw motors. During 3.6-118 yaw actions multiple extendable cylinders individually engage and disengage with brake calipers attached to the other movable part, enabling rotor yaw action. The ‘storm-proof’ design allows controlled yaw slippage even during extreme gust conditions, now becoming more common as a consequence of ongoing climate change. For onshore application the power electronic converter, transformer, switchgear and turbine control system are all incorporated into a climate-controlled house separated from the turbine called the ‘Turbine Station’. When put offshore a Turbine Station is attached to the tower at roughly 20-metre elevation above sea level. Mervento onshore turbines finally come standard with 125-metre hub height. Unusually for such a height, it chose a steel tower with stay cables. These cables come in three pairs and are equally spaced at 120 degrees around the tower circumference. Each cable pair extends from about halfway the tower height towards ground-based concrete supports at some distance away from the tower base. Explaining the decision, Kristola: "The stay cables absorb rotor thrust loads, thereby eliminating tower root bending moments. This offers combined benefits of substantially reduced tower and foundation dimensions and costs while also eliminating tower resonances. Furthermore, a steel tower is fully recyclable with low decommissioning costs." The business plan aims to install another two-to-three turbines in 2013 and a further ramp up to several tens of units by 2014.